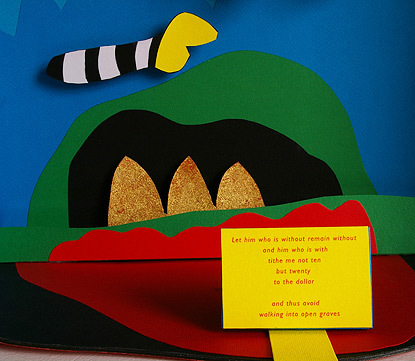 This animated clip illustrates the three-dimensional HOW GOD TALKS IN HIS SLEEP AND OTHER FABULOUS FICTIONS featuring the Book Sculpture and the Folios. 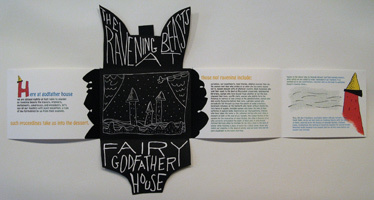 The voice-over excerpted from Folio 5, THE RAVENING BEASTS AT FAIRY GODFATHER HOUSE is read by its author Leon Rooke. The complete bookwork is housed in a black clam box handmade by Felton Bookbinding of Georgetown, Ontario. It measures 17 x 12.75 x 6 inches (43,5 x 32 x 15 cm). The bookwork is comprised of a book sculpture and six folios inside a slip case which supports the book sculpture. The exterior clam box and the book together weigh 18 lbs. (8.2 kilograms). 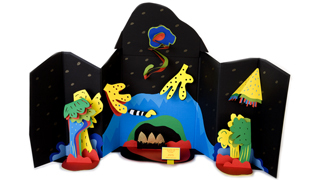 The foldout book sculpture, designed by Tony Calzetta, is constructed of handcut coloured papers and was hand assembled. This three dimensional component contains one of the fictions, How God Talks in His Sleep, and is supported by the slip case. The introductory essay was written by ROBERT ENRIGHT, Senior Contributing Editor of Border Crossings and University Research Professor in Art Criticism at the University of Guelph, Ontario, who has published more than a hundred interviews on leading Canadian, American and European artists. Robert's essay is part of the first folio which also contains a foreword by the publisher, a list of subscribers and the colophon. The remaining five folios enclose the Other Fabulous Ficitons and their visual elements. 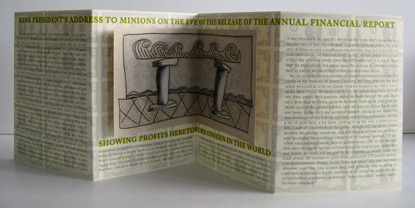 There are three individual fictions (Bank President's Address to Minions on the Eve of the Release of the Annual Financial Report Showing Profits Heretofore Unseen in the World, The Ravening Beasts at Fairy Godfather House, Ms. Smith is Hard Put to Explain to Her Husband How She Came to Spend the Night Unexpectedly in Philip's Nightgown), a two-part fiction (Cezanne's Muse, One and Two), and a trilogy (The Scroll of Civilization, Son of Scroll, Daughter of Son of Scroll). 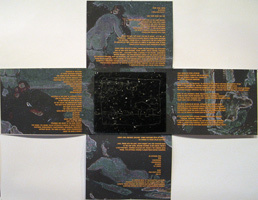 Each folio has been designed with unique elements and materials chosen to complement the artwork and the text combining digital and printmaking methods. 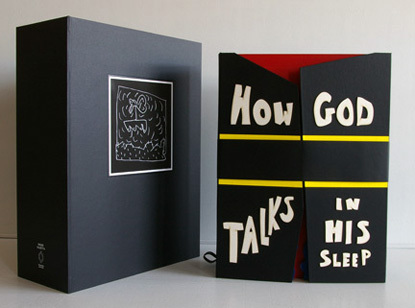 How God Talks in His Sleep and Other Fabulous Fictions is an edition of forty-five copies, seven artist proofs and one handling copy.